The Montreux sling collection, named after the home of the jazz festival in Switzerland, transforms style and sturdy construction into a work of art. 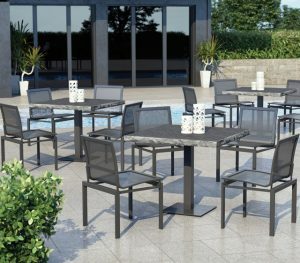 This outdoor sling bar height patio furniture collection is a perfect interplay of extruded aluminum seamlessly blended with cast aluminum details and features sling fabric strung taut across the seat and back. 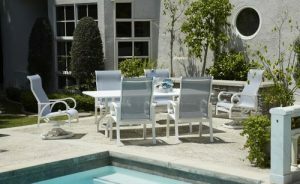 Berlin Gardens is a leading manufacturer of outdoor living products. 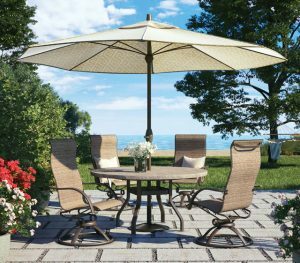 Berlin Gardens’ strong focus on quality, service, design and respect for the environment makes it a recognized brand the most demanding consumers are choosing with confidence. 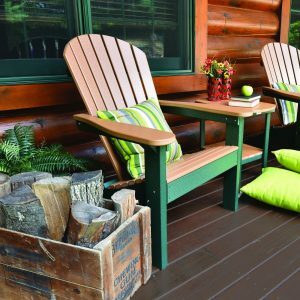 Each piece of their furniture is made with great care by skilled Amish craftsmen using only the highest quality recycled materials. 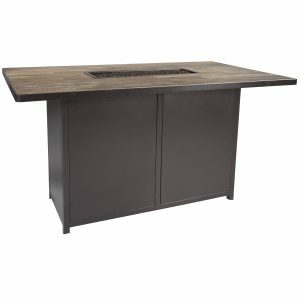 This 42″ x 72″ bar height fire table has a 38″ table height and is perfect for counter stools for a unique and comfortable dining experience with the enjoyment of a linear fire burner down the center of the table. 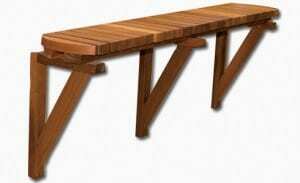 Also available in dining height along with numerous different finishes and tile top options. 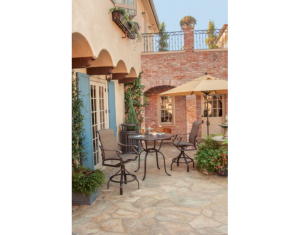 Take a vacation anytime in your own backyard!! The Key Largo Collection is named iconic archipelago off the southern coast of Florida. Key Largo’s laid back comfort and stunning presentation is inspired by fiery sunsets, swaying palms, and a history of literary and eco-culture. 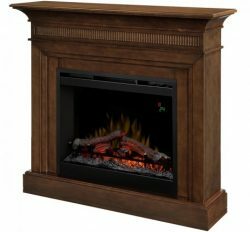 The timeless appeal of this warm walnut mantel will add instant ambiance to any setting. The fluted face and corner detailing adds just enough charm without taking away from the beautiful fireplace found within. 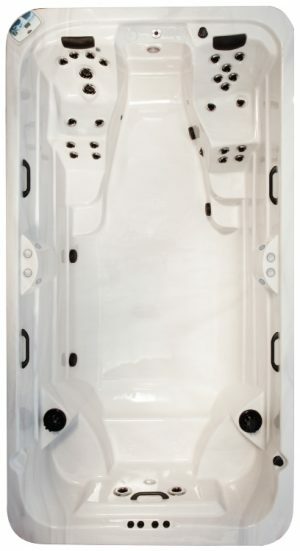 Solo bars are the perfect compliment for your spa and add the finishing touches to your backyard retreat. The bar features rounded corners for a sleek, finished look and is perfect for entertaining. Sized to match your spa (64” or 72”), the bar is 11” deep.